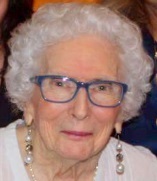 Eileen Regina Catalano, 88, died Tuesday, April 02, 2019 at Parker @ Somerset in Somerset, New Jersey. Mrs. Catalano was born May 18, 1930 in Brooklyn, New York to the late Michael and Anne (O'Connor) Norton. Eileen lived in Somerset, New Jersey for many years and was previously from Basking Ridge. Eileen was a longtime parishioner at St. Matthias church in Somerset. She was also a member of the Legion of Mary. Eileen loved her family; she was a loving mother, an adoring grandmother and a caring sister; she will be deeply missed. Mrs. Catalano was predeceased by her spouse, Salvatore Catalano and her sisters, Anne Timoney, Katherine Collins and Mae Dunne and brothers, Edward Norton and Peter Norton. She is survived by her children, Grace Collins and her husband Joseph of Franklin Park, Anne Catalano and her husband John Stevens of Vestal, NY, Joseph Catalano and his wife Janis of Whippany, Michael Catalano and his wife Lori of Somerset, Anthony Catalano and his wife Carolyn of Kendall Park, and Mary Acevedo of Somerset; her sister, Frances Nolan of Riverhead and brother, Joseph Norton of Kings Park, NY; her fourteen grandchildren, Courtney, Sal, John, Shannon, Angela, Gabriella, Veronica, Peter John, Carlos, Krysten, Gianna, Kaitlyn, Amanda and Christina and many nieces and nephews. Visitation will be held at Gleason Funeral Home 1360 Hamilton Street, Somerset, NJ on Saturday, April 6th from 3:00 to 5:00 P.M. and 7:00 to 9:00 P.M. and on Sunday, April 7th from 2:00 to 6:00 P.M.
A Mass of Christian Burial will be held Monday, April 8, 2019 at 10:00 A.M. at St. Matthias Church. Burial will follow at Holy Cross in Basking Ridge. In lieu of flowers, please consider donations to St. Jude Children’s Hospital, www.stjude.org.